I found this thing in a hole-in-the-wall shop in San Francisco's Chinatown. As usual, if I spot a bootleg that I can't identify, I need to own it. I actually found so many bootlegs during that last trip that I had to ship them back home in a separate box. That's how sick I am. And the sad thing is that half the time the only reason I buy them is so I can document them and share them with you. After that, they just sit in a box, or get auctioned off. At least, that's the way it tends to be with modern bootlegs. So this one was interesting to me because it was a robot design I was not familiar with. I thought it first it was some original Chinese design that loosely resembled a Transformer, but after some digging I found out this was based off of an actual Transformer. This is based on the Transformers Classics Minicon "Firebot" released in 2006. However, where the minicon was only a few inches tall, this one is about 7 inches tall. Bootlegs, most specifically the ones originating in China, are most often scaled up from smaller toys, a process that is explained by science but feels like magic. So I hereby name this Chinese Scaling Magic, or CSM for short. Through CSM you can take any size toy and make it any other size. I don't know the reason for this, perhaps it skirts some obscure trademark law, but whatever the reason, I love CSM. "Third Movie Edition Collect Robots"
Obscure Transformer + CSM + awesome Chinese translation = WIN. 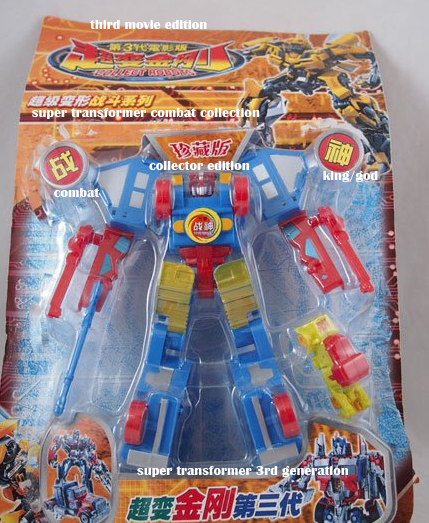 The sticker on the chest reads "Combat King Invincible". The toy is a massive piece of crap. Let's be clear. My fascination with these things isn't about the quality. It's the WTF re-imagining of them that blows my mind. It's made out of a thin ABS plastic that is actually rigid and nicely detailed, at least on one side. The backside of most parts are hollow. Of course, compared to the original, the detail is largely lost. But what is there is nice. Some changes have been made, most notably the head. Instead of the original Firebot's head, there's now a generic Optimus Prime head. The minicon port used to be in the chest, now the circle is flat and covered with a sticker. I think the gun is also new to this toy. There's no place for it in vehicle mode. Truck mode is nice and simple. It looks like it belongs in the Playskool Gobots line. Despite the CSM effects, the parts fit together nicely. The vehicle mode is based off of a Rosenbauer Oshkosh Striker Fire Truck, commonly used at airports. Also included with the set is a tiny little movie version Optimus Prime. I thought this was the small version of Prime that came with Stratosphere, but it's different. Can anyone identify it? It's the toy that keeps on giving. And if you can tell me where the little Prime is from, it's yours. First correct comment gets it. The mini Prime figure is copied from the first Transformers live-action film. Here you can see it compared to legends class figure redesigned for the second film. Looks like the Movie Legends optimus prime. check out the back tires. They look the same. My favorite part is "third Movie Edition!" It begs me to ask is there some cheezy Chinese transformer-like film out there!??!! the vehicle mode looks quite good! This is the obvious king of all combat. Aptly named. Any that meet him in the field of battle will fall before his mastery of combat. With that deco and his alt mode, he kinda looks like g1 hotspot. Classics hotspot perhaps? At least, I have the proper toy that the little Prime's taken from. He is one of the 'Movie Legends' series. I think he's from the 2007 line.